How do you know if the receipt paper you are handling is BPA-Free or not? Up until recently, it has been virtually impossible because all BPA-Free thermal receipt paper looked exactly the same as non-BPA-Free. As we discussed in our December post, a study conducted by the Environmental Working Group in July of 2010 indicated that 40% of the receipts sampled from major retailers contained BPA. While the health effects are still unclear, this study has aroused concerns among consumers as well as retailers. We are pleased to announce that the market is changing. In November Appleton, North America’s largest producer of direct thermal media announced the addition of easy-to-see red fibers to its most common POS receipt paper grade “Alpha 400-2.1”. Appleton designed its 'red fiber' BPA-free paper to help consumers and retail workers quickly identify the kind of thermal receipt paper they are handling. It is important to note that all Appleton thermal paper is BPA-free, but only the most common receipt grade contains the red fibers. 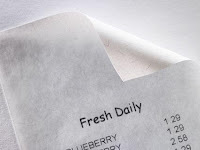 At this time, offshore supplier Koehler also has BPA-free receipt paper; their grade "KT48FA". Koehler is a large supplier of thermal paper to the US. This simply means that your thermal receipt paper may be BPA-Free even if it doesn't have red fibers. If you purchase thermal receipt paper and are concerned about the effects of BPA, ask your supplier about the BPA-free options available to you. You can visit http://www.possupply.com/BPA-Free-Thermal-Paper-Rolls for a complete list of the products that we offer.